“Willie Day is a good friend and was one of my closest running rivals. On many occasions we battled fiercely on country and road, over short relay legs or long distances and there was seldom much between us at the finish. At no time was there any ill-feeling: on the contrary, we joked and took the mickey out of each other frequently as well as ending up in the pub afterwards. Such a relationship was not possible with certain other runners! Our first head-to-head was in May 1971 when I only just managed to get away from Willie and Colin Martin to win my first SAAA medal. – bronze in the track 10 miles – a very long way behind Lachie Stewart and Donald Ritchie. By October Willie won the first stage of the McAndrew Relay in 13:46 which was third fastest on the day. I was more than thirty seconds down. However a month later I ended up one in front of him after a gruelling and disappointing cross-country race for Scotland B Team against Northern Counties at Catterick. We both attended the ‘International Training Sessions’ at Cleland Estate, Motherwell, rubbing muddy shoulders with real stars. In the 1972 National I was nineteenth and – surprise, surprise! – Willie was twentieth! Although Willie Day had his moments on the country, in my opinion his best surface was road. Certainly he ‘murdered’ me on 20th May, 1972, when he won the 15 miles Drymen to Scotstoun classic by more than four minutes. (He also won the race in 1974). The see-saw nature of our encounters continued a month later when he dropped behind myself and the inimitable Alastair Wood at 15 miles in the SAAA Marathon Championship. I lasted one more mile before the old fox strolled away for an easy victory. Willie dropped out and I hit the wall before struggling in third. The point is that Willie hung on as long as he could rather than pacing himself into the medals. His tactics were frequently gung-ho, Willie might blast off at the start or stick in ferocious surges mid-race. At times he paid for it especially when he wasn’t particularly fit, but what the hell? No one could accuse him of cowardice! Running was meant to be dramatic and to be fun! When I skim through my records, there is a great deal to prove how evenly matched we were. At times I might be a fair bit ahead, but you could be sure that not long afterwards Willie would repay the compliment in style. His best period was when he was training with the charismatic Jim Dingwall and several others in the excellent Falkirk squad. I have a puzzlingly vague memory of coming through from Edinburgh one Saturday morning to stay with Jim and train with him and Willie. It seems likely that we did a hard ten miler that day, followed by a serious period of real ale rehydration in The Wheatsheaf and The Woodside. Sunday morning featured twenty or more serious miles of hangover cure! No wonder Willie ran his fine marathon pb in 1977 to win silver in the Scottish behind Jim’s championship record. I was fourth that day but still managed 2:19:35 with the added pleasure of watching Willie receding rapidly over the horizon. His success couldn’t have happened to a nicer guy. Nevertheless when the three of us attempted the International Enschede Marathon in Holland that August, on a very hot day, we all blew up. Willie was only two places in front of me but we both beat Jim! Willie and I couldn’t stop laughing at excerpts from the book I was reading – ‘The Fall and Rise of Reginald Perrin’; and on the ferry back we drowned any sorrows in the company of boozy superstar Ron Hill! Three significant race memories to finish. In May 1975 I won the Drymen after an exhausting struggle to hold off Willie Day. My tactic was to go mental up the hills on the Stockiemuir Road up to Queen’s Drive at the five mile point. Unfortunately Willie’s downhill skills were much better than mine and I only just managed to stay clear. Whew! Sandy Keith was third. Only a few weeks later I won the Scottish Marathon in a lifetime pb with Sandy a close second which suggests that Willie should have entered too. Still he fulfilled his marathon potential two years later. In April 1978 only three were bold enough to turn up at the Coatbridge track for a successful attempt on the (soft) Scottish Native Record for 20K. Willie and I used to joke that any long ‘Highland Games’ road race in Scotland around then was liable to be won by one of us or Doug Gunstone. In turn we took the lead for two laps maintaining the steadiest of five-minute miles until the others tired a little, and I moved away. At the hour (19300m) I was only 96 metres in front of Willie who, for reasons best known to himself, then stopped dead allowing Doug to take second at the 20K finish a couple of minutes later. The three old rivals were a bit disappointed because we only just missed out on running 12 miles in the hour but it was an impressively smooth ‘team’ performance nevertheless. The above are some of the personal comments of Colin Youngson of Aberdeen, three times Scottish Marathon victor and with a total of ten marathon championship medals in his cabinet, about Willie Day and they indicate something of Willie’s competitive nature and of his popularity with other athletes of the time. The thumbnail is of Willie winning the Strathallan Meeting 20 miles road race in 1973. * He ran in almost all road races in Scotland at one time or another and recorded victories almost all of them at some point. The classic races were the Tom Scott 10 miles (he ran in this one eleven times and was inside 50 minutes on no fewer than nine occasions – remarkable! ), the Haddington 10, the Balloch to Clydebank 12 miles, the Springburn 12 miles (won in 66 minutes – a record), the Airdrie 13 miles, the Shotts 14 miles, the Babcock 14 miles, the Dunblane 14.5 miles, the Clydebank to Helensburgh 16 miles, the Rothesay 18 miles (first in 1969 in 1:39:30 and in 1970 with 1:44:46), the Strathallan 20 miles and the Edinburgh – North Berwick (22.6 miles most of the time although for a few years it was full marathon distance). And of course there was the Drymen to Scotstoun mentioned by Colin above where he had two firsts (in 1:19:48 and 1:19:02) and two seconds!. Then there were the half-marathons at Stirling, Falkirk, Kirkintilloch, and the Isle of Skye where he set a record no fewer than three times. * In the Grangemouth Round the Houses race organised by his own club where he has been second a total of six times – each time to a top class athlete – Jim Dingwall, Alistair McFarlane, Don Macgregor, Doug Gunstone and Allister Hutton were the winners in these years. People always ask about the training of successful runners such as Willie and when asked he says that in the beginning when he started running under the guidance of Tommy Todd at Falkirk, he reckons he was doing about 60 – 70 miles per week with the Sunday long run being about 16 miles. Almost all runs were from the hut at Falkirk – not the swish modern one but the old wooden one! Tommy also had the runners doing some circuit training including sit-ups on a home-made inclined board. Tommy died suddenly while still quite young and Willie’s training continued to develop. He listed the following sessions that he used to do: 20 x 300 in about 50’s with 90 seconds recovery; 32 x 400 in 68’s with 90 seconds recovery; 6 x 800 in 2:15 with 5 minutes recovery; 4 x 1500 in 4:30 with 5 minutes recovery; 6 x 1 mile in 4:40’s with 5 minutes recovery and these were all done with Willie Sharp. After he started running marathons when he was working in the Post Office he could train at night and his week worked out something like: Monday – Steady 10; Tuesday – 15 miles; Wednesday – 20 miles; Thursday – 15; Friday – 10; Saturday – Race or 15 miles; Sunday 25 miles. One of the 10’s would be a fartlek including eight bursts of 60 metres in a mile and the total run took about 52 minutes. When Jim Dingwall heard from some of his friends in England that the steady 25 miles on Sunday was not a good session, they would instead do 20 fast (ie about 1:56) which was done on a Sunday morning at 8:00 am. In this context it should be noted that he ‘Did the Diet’ just once and that was in the SAAA Marathon Championship of 1977 where he was second. He reckoned that it worked for him but didn’t do too many marathons thereafter and so didn’t repeat the experiment. His depletion run the previous week was done in company with Jim Dingwall and Willie Sharp: there was a club outing to Aberdour and the three were dropped off the bus at the Kincardine Bridge and they ran to Aberdour – 20 miles of it. Then when the others were having a nice meal they were keeping off the carbohydrates and starches! Although his career extended from the mid 1960’s until 1990, Willie’s best years were the 1970’s and we could have a look at some selected races in that decade now just to get a flavour of how well he was running. In 1971 he really started to show at the head of the field in road race. His run at Gourock where he was second to local boy Bill Stoddart in the 14 miler was followed by second to Don McGregor at Strathallan in 1:58:23. His real breakthrough that year however was with the West District victory in in the 10000 metres and his first SAAA medal in the marathon. He started 1972 with twentieth place in the National Cross Country Championship. Later that year he really established himself as one of the ‘big boys’ on the distance running scene with victories such as Helensburgh in a time of 1:25:18 from Pat Maclagan (winner of the SAAA marathon the previous year) in 1:25:31, and the Scottish Marathon Club 12 miler the week afterwards in a new course record of 65:00 for the long 12 miles course. (There seemed to be a thing at the time of courses being made hard – hilly marathon courses such as the ones from Westerlands were encouraged; the Helensburgh 16 miles was recognised as being at least quarter of a mile long; the Kirkie 10 was much further and Alastair Wood at his best could only manage 55 minutes for it; the Springburn 12 was undoubtedly more than that). These races were chosen because they were in consecutive weeks and show the form that Willie was in at that point. This continued until at Strathallan in August he took two minutes from his previous best time with 1:55:19 when finishing second to Alex Wight. On the track in 1972 his best time for 10000 metres was 29:59.6 placing him fifth in the championships at Meadowbank and for 3000 metres 8:34.4 for fourth place at Grangemouth in mid September. In 1974 he showed what a tough competitor he had become when he started the season with a 49:40 for the Tom Scott race: although he was less than a minute behind the winner, he was fifth across the finishing line. Ahead of him were Jim Dingwall (EC) 48:45; Doug Gunstone (EAC) 48:46; Martin Craven (ESH) 48:48 and Sandy Keith (EAC)! Came the Clydebank to Helensburgh on 26th April he had another brilliant run winning it in 1:24:13 from Alistair McFarlane (1:24:57) – a future SAAA Marathon champion. By the end of the summer season 1974 he had run 14:51.2 for 5000 metres and 31:07 for the 10000 metres in July. He again entered the Maasluis race where he was eighth this time in 2:25:24 (the winner did 2:21:11) in May which ranked him twelfth in Scotland. Coming in to the winter, he showed good form on the first stage of the Edinburgh to Glasgow in November when he was second on the first stage in 27:26: two seconds slower than stage winner Colin Youngson running for Edinburgh Southern and no less than twenty seconds up on third placed Jim Alder. He finished the cross country season by being twenty first in the National. Into the summer season in 1975 he ran the Clydebank to Helensburgh again in April, this time finishing third in his slowest time for several years (1:27:50) behind winner Phil Dolan (Clydesdale) in 1:26:25 and his own team-mate Willie Sharp who was second in 1:26:53. Conditions always played a big part in times for this race – it was a straight run for 16 miles from East to West with the prevailing wind in the runners’ faces; in the year when all the good times were set (1973) the wind had changed direction to be a strong wind directly behind the runners for most of the race. In May he won the SAAA medal that eluded him in the 10 Miles when he was second to Bill Yate of Maryhill who had a brief but successful career in athletics. Yate won the West District 10000 metres track championship with Willie second in 30:34.2 and Phil Dolan third. This was his quickest 10000 metres of the season. In the SAAA Marathon at Meadowbank in June he ran 2:43:58 to finish a lowly fourteenth. In August he was most unlucky not to win another SAAA track championship medal when he was fourth in the 10 Miles track championship at Carluke. On a day of torrential rain a strong winds, Doug Gunstone won with a superb run of 48:55.4 from Colin Youngson in 49:00.8 and Martin Craven third in 49:40. Willie was unlucky twice – once in not getting a medal and, a bit more cruel, once in being timed at 50:01 – just missing a sub 50 minute clocking in atrocious conditions. 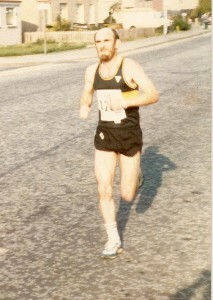 In November he was asked by Falkirk Victoria to run the sixth stage for a good team in the Edinburgh to Glasgow: he did his by now usual good job and pulled them from ninth to seventh in a very competitive leg being less than a minute behind Dave Logue’s fastest time on the stage but 40 seconds quicker than Gerry Hannon of the Belfast Achilles club. On the second stage for Falkirk Victoria in that relay was their new recruit: the big boost for Falkirk that year came with the arrival of Jim Dingwall from Edinburgh AC. Jim was a top class runner, an SAAA champion and a man with times below 3:50 for 1500 metres, below 14 minutes for 5000 metres and a top class road and country runner with a wealth of experience to offer. In the National for Edinburgh Athletic Club in 1974 he finished thirteenth and was out of the medal winning team since the other runners in the club were 1st, 2nd, 5th, 8th, 10th and 11th! When his job took him to the BP Plant at Grangemouth the nearest club was FVH. He was popular, friendly and a hard trainer. He added a lot to the Falkirk scene. Jim’s first run in the Edinburgh to Glasgow for Falkirk Victoria was in 1975 when he ran the very tough second stage and brought the team from fourteenth to eighth. He and Willie became firm friends. They trained together and maybe Willie gained even more self belief from the relationship. Whatever the case, there were benefits all round from that particular move. On the track in 1976, his best times were 31:02.8 for second in the West District 10000 metres championship at Coatbridge on 19th June, 14:54.0 for 5000 metres at the SAAA Championships in Meadowbank for ninth place and 9:43.0 for third in the District Steeplechase Championship at Coatbridge on 29th May. Having started the summer well with a victory over Alistair McFarlane in the Dunky Wright 5.4 miles race at Clydebank, his marathon best was in the star studded field at Rotherham on 8th May. This race was the trial for the Montreal Olympics and it was described as follows by Colin Youngson and Fraser Clyne in “A Hardy Race”. Then in November 1976 the Falkirk team won third place medals in the Edinburgh to Glasgow Relay. Jim Dingwall ran on the second stage and brought them from twelfth to first with 28:34 which was the fastest time of the day for that stage. Willie ran the tough sixth stage and with the third fastest time of the day behind Dave Logue and Doug Gunstone kept them in the third position that he started with. the other team members held on and at the finish they were well clear of fourth placed Victoria Park. The club runners were all training and racing well and it showed in the National Cross Country Championships at the start of 1977 when they were fourth team with Willie in his best ever place of ninth in the individual race. He was a bit amused or bemused, not sure which, by being told that 9th place made him non-travelling reserve’. He had however already raced in San Silvestre at New Year in a representative race with Jim Dingwall and Allister Hutton and finished twentieth. That year he had another good summer on the track with his times of 30:35.2 for 10000 and 14:59.9 being well up to standard – but his summer 1977 will be remembered for one race – the SAAA Marathon where he finished second to Jim Dingwall. It’s back to ‘A Hardy Race’ for the actual report. “1977 was to see the fastest ever Scottish Marathon Championship until 1999 (the race in 1999 was thrown open to all the runners in the Dunfermline to Edinburgh marathon and the first three places were filled by a Mexican, a Pole and a Kenyan – BMA) Once again it was over the usual Meadowbank course on a warm day. The main man was that schoolboy 100 metres sprinter turned middle-distance and road runner, Jim Dingwall: the ‘Guv’nor’ as he was known at Edinburgh University or ‘The Head Waiter’ as he was cursed by those who had suffered his famed kick to the finishing tape. Jim writes “I had been blown away so many times in the SAAA 5000 metres by Dave Black of England that I thought I’d better try the marathon. I had always been fascinated by those hardy souls charging off for Longniddry while the posers ponced around the track at Meadowbank.” Jim ran over 4000 miles in 1977 including many weeks of over 80 miles and no less than 96 in the week of the SAAA marathon championship. Team spirit in Falkirk Victoria Harriers was excellent at the time, and he trained with other club members on Sundays, Tuesdays, Thursdays and Saturdays if there wasn’t a race. “Guys like John Pentecost, John McGarva, Joe Gibson, Willie Sharp and Willie Day made sure there were plenty of hard sessions. Recovery runs were from his home in Falkirk to his work in Grangemouth; and back. In the SAAA Marathon) Jim Dingwall, confident but uncharacteristically, led from the start passing 5 miles in 25 minutes exactly. By 10 miles (51:12) he had opened a two second gap on Sandy Keith who had 20 seconds on Colin Youngson, Willie Day, Martin Craven and Dave Clark with Phil Dolan and Alistair Blamire another 30 seconds down. By half way Willie Day had made a big effort and caught Dingwall and Keith. The three leaders recorded 67:04, 50 seconds clear of Youngson and Clark. Dingwall surged strongly after 15 miles and passed 20 miles in 1:43:08, more than a minute clear of Keith and Day. … Into the Stadium to rousing applause. Whoopee! the added thrill was to be followed home by Willie Day for a Falkirk one-two.” Jim broke the existing championship record by 45 seconds with 2:16:05 which has never been beaten by a Scot. Willie Day won silver in 2:17:56 and Sandy Keith bronze in 2:18:52.” Later that year he went to Enschede with Jim where he was 77th in 2:31:20. Willie himself reckons that this was his best ever race and on reflection feels that he could maybe have won it. It was as he says “Hammer and Tongs” right from the start with Jim, Sandy and himself really pushing on. When Jim moved out after 15 miles, Willie knew he had a 2:16 marathon runner beside him and decided to stay with him. When Sandy dropped back relatively soon thereafter. Jim was too far away to be caught. Every corner he turned, Willie could see Jim ahead and that quarter of a mile that he had snatched early on was what won the race for him. In addition Willie had had a hard road race just two weeks before the marathon: it was in the very hilly Bearsden Highland Games 10 miles where he ran away from Colin Youngson over the last mile to win in just over 50 minutes which is a fast time for that trail. In August that year he, Jim Dingwall and Colin Youngson travelled to the famous Enschede Marathon in Holland and the story of that race is in Colin’s tribute to Willie. at the top of the page. The picture is of Willie in the Enschede and there are two more on the ‘Gallery’ page. In Europe: Enschede (Holland), Le Quesnoy (France), Maasluis (Holland) twice. His two races in London were not among his best – on each occasion he had been away ski-ing with David Lothian in France and Austria and came back undertrained, under raced and just a bit tired for a marathon! The race in Le Quesnoy was in July 1980 and Jim Dingwall won in 2:28:40 with the Falkirk team of Jim, Willie, Davie Lothian and Mike Logue second. Like many of the top endurance runners of his time, he did not do much racing as a veteran – he did some races and was picked for two representative races on the strength of his running in the Allan Scally Relays which were the trials for the teams. Bob Gray saw a race in the Hague in 1989 advertised and Bob, Willie and Kenny Rankine (who was not yet a vet) travelled and in the race Willie was second vet. He was approached in 1976 by the mother of John Pentecost (one of his FVH team-mates) who was a teacher in Falkirk: Among her pupils were several girls who were interested in athletics and the result that Willie helped found the Falkirk Victoria Harriers Ladies Section which is now a large and thriving section. He himself is a very good coach although most, if not all, his athletes are field event athletes. Although we have concentrated on his road running with a wee look at track times and medals, Willie was good on all surfaces running well enough over the country to have several representative appearances for Scottish teams as already noted, and he also ran in several English Cross Country Championships – at Norwich, at Luton and at Parliament Hill twice. He also ran in some hill races – fourth in the prestigious Carnegie Hill Race, sixth in the Half Ben Nevis race, unplaced in the Glen Bash and second to club-mate Sam Downie in the classic Spean Bridge to Fort William race. I haven’t even mentioned his running on the half-marathon scene where he raced at Alloa, Stirling and many others including the Luddon Half Marathon at Kirkintilloch which he won from its usual high standard of entries. Road, country, track or hills – Willie Day was a top class athlete on all surfaces. When I asked Willie what he got out of the sport, he started by saying the satisfaction and the camaraderie and then he interrupted himself to say, very strongly, “I just loved running; I loved to run!” He liked meeting different folk, going places, then when you think you’re quite good you get beaten and it puts things in perspective. He wouldn’t have changed any of it. And when you think of it “I just loved running, I loved to run”, sums up what everyone who has had a lengthy involvement in the sport feels. It’s one of the things that unite runners of all generations from Dunky Wright and Donald Robertson right through to the present day. Willie is currently working hard with his club, Falkirk Victoria Harriers in several different roles – coach, official, administrator – following the Harrier tradition of doing what his club needs him to do.